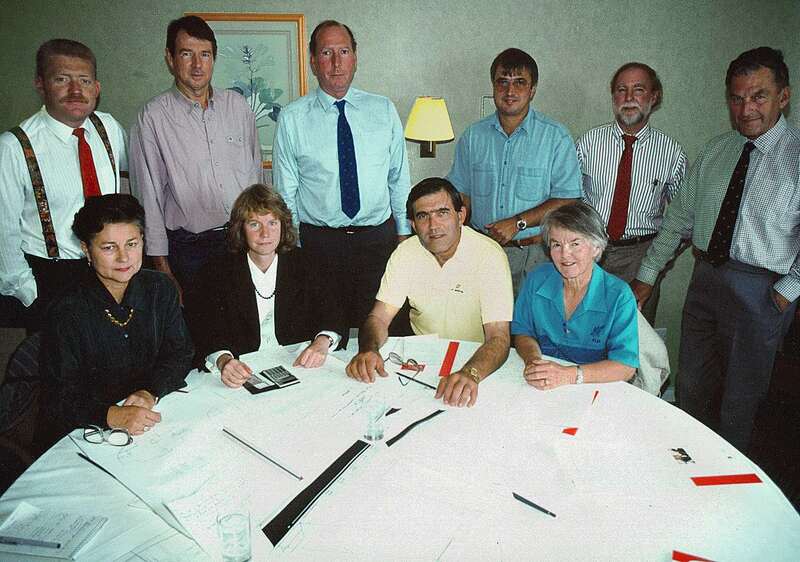 This was the first major international design competition during the 1990’s. Yachting World was looking for a competent boat to be handled by a couple and cruised without limitations. 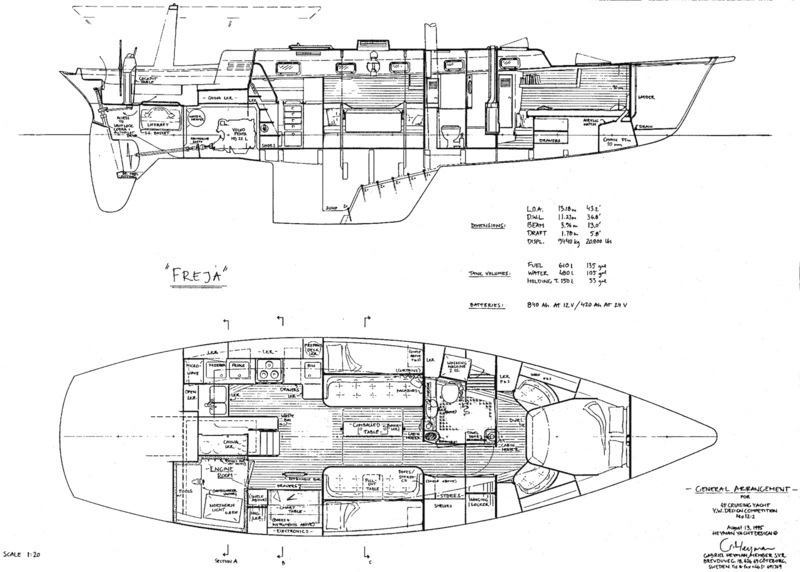 I felt that the demands would be met poorly by the standard heavy cruising yacht or the modern cruiser-racer. When standard solutions will not work, the basic concept has to be sought by looking into the things that matter – easy motion, good speed, convenient handling, safe cockpit, first-class galley, proper navigation station and a couple of good sea-berths. Features like a double berth tucked in beneath the cockpit sole or a centre cockpit were not on my list. 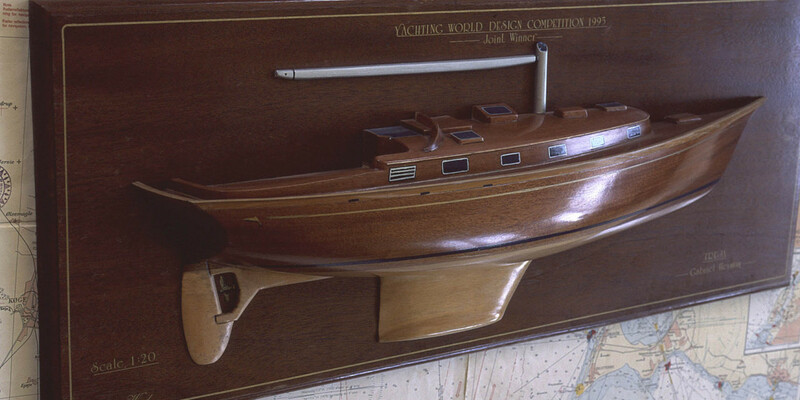 If cost was not decisive, between 40′-45’ overall length seemed desirable. However, a new design is never entirely new and a designer will seek inspiration. I found mine in old copies of Rudder magazine, Yachting World Annuals and biographies about yacht designers of times passed. I then sat down to create something new. Here are a few comments on the more unusual solutions. The centre of buoyancy is further aft than usual. This helps making the bow unusually sharp so it will slice easily through waves, without excessive pitching. 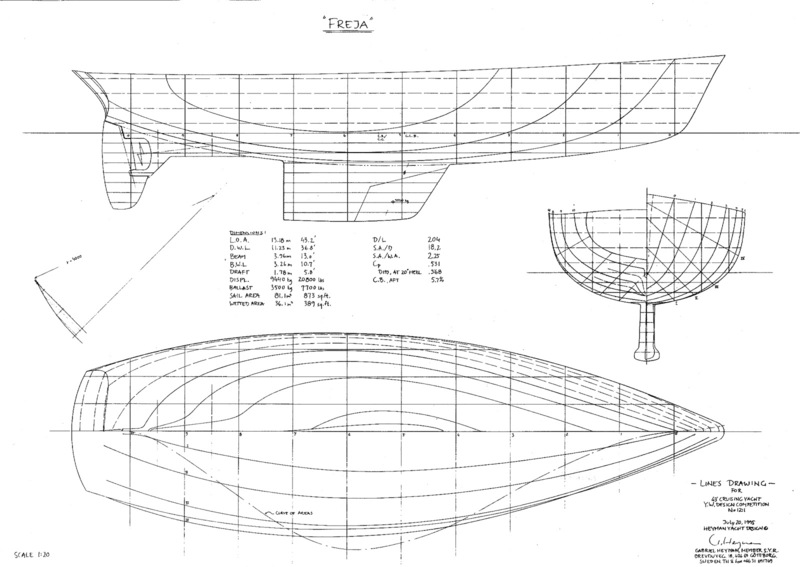 Boats are generally not designed like this because in theory such a shape will increase resistance slightly – based on tank results in flat water. An aft-raking transom seemed more attractive but with short overhangs there may be a problem – in surfing conditions they may drag a huge stern wave, rising above deck level (see photo below by Keith Beken, showing a French yacht racing in British waters during the 1950’s). So I designed a new kind of “ducktail” transom to prevent this. If the boat is fairly light, giving a flatter wake, this might just be the right shape to force the stern wave to separate at the bottom edge of the transom. No-one liked this idea though; you might say I won the competition despite the transom! See the judges’ comments below. The other drawback with a traditional aft-raking transom is that you usually don’t get a boarding platform. So Freja has a simple opening transom which simply folds down, opening the cockpit and turning this part of the boat into a great area for swimming, playing with water toys or going in the dinghy. The machinery space needed to be between the cockpit and the cabin but it was not considered necessary to have standing headroom in this area. Instead, an open hatch gives light and air. So the house was given an asymmetric shape; there are two windows connecting the cockpit and the interior: From the nav. station, facing the cockpit, and from the galley, for serving breakfast outdoors, under the shade of the bimini…. 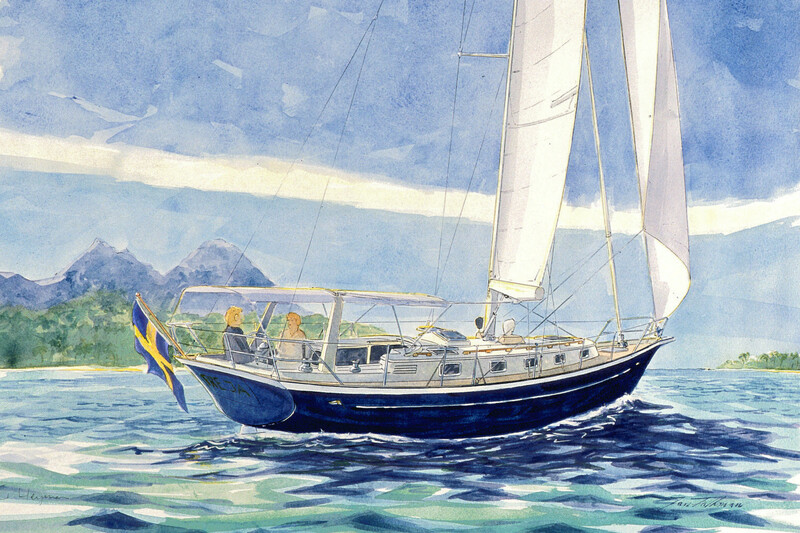 The cockpit can be protected by a soft dodger, a solid windscreen or doghouse and with the mainsheet on an arch, the bimini can be used also under sail. Despite the obvious hazard of an accidental gybe, most sailors neglect rigging a preventer – and rigging one may be a hazard in itself. So I developed a permanent single-line preventer which does not have to be shifted when gybing and works well whenever the sheets are eased. The chart table, inspired by commercial vessels and by cruising yachts like Wanderer III, takes over 500 unfolded charts and is used standing. There is a bar to brace against which, being padded and adjustable sous le derrière, is quite comfortable. The starboard table leaf will obstruct passage forward, like on many other boats. However, a small table can be pulled out of the backrest for a cup of coffee or a game of cards. Above the saloon table there is an old-fashioned skylight. Skylights as they were built during the first half of the 20th century were great devices but usually leaked so here are simply two deck hatches mounted on a raised part of the deck moulding. There is a large ventilated cabinet for dry storage where fruit can be kept on net shelves. For warm climates, there are 20 opening ports and hatches. In cold weather the boat will be dried by air coming through the compartment surrounding the mast, through the bilges where moisture falls out as condensation, and into the accommodation. This is a time-tested, but forgotten, solution. Two heaters are used for warming the main cabin and sleeping cabin; either one will also heat the wc/shower. There is a towel drier heated by one of the chimneys. Sail area 81,1 sq m 873 sq.ft. Wetted area 36,1 sq m 389 sq.ft. E-glass / isopolyester & PVC foam sandwich above hull side girder, single skin below. 3 sandwich bulkheads with solid inserts, plywood covered. Bolted lead ballast keel. Moulded rubbing strake. Hull – deck joint bolted, capped and laminated on inside. Varnished teak grab rails and “eyebrow”. Deck fittings s.s. and bronze on solid inserts. Stanchions and pulpits 75 cm (30″). Cockpit seats and sole teak covered. Volvo Penta MD 22 L, 50 hp (36.5 kW) at 3000 r/min, reduction 3,0:1, on soft mountings with flexible shaft system. 3-blade feathering propeller 500 mm diameter. Access from engine room and removable panel in galley. Separate 220 V / 50 Hz generator, 4,8 kW capacity for running water maker. Spare energy used for battery charging, water heating and washing machine. Housed in sound-proofed vented box on soft mountings. 12 and/or 24 V system with 8 batteries each 105 Ah 12V; one dedicated for engine starting, one for instruments and running lights. Stainless steel tanks; 610 l fuel, 480 l water. Connecting pipe with valve can be opened before tacking to increase stability. Tank capacity may be increased; total maximum approx. 1300 l. Water maker 60 l / h. Hot water 55 l heated by engine cooling system or by 220 V from generator. Aluminium mast and boom. Aftermost shroud may be released. Sail area can be changed from cockpit in even increments from 104 m_ to 34 m_ (or, with reefed mainsail only, 15 m_). 27 kg CQR on roller in bow platform; electric anchor windlass, chain self-stowing. Chain pawl for hauling manually. Anchor locker optionally forward or aft of collision bulkhead; aft position with airtight box and inspection hatch for cleaning + drain pipe with tap. “With a single reservation, Freja’s mix of characteristics were the most appealing to me – dark hull, old fashioned cove stripe, long low house with plenty of ports and the almost traditional interior. Here’s a cutter rig we all know works, with the slot between headstays wide enough for the yankee to blow through, slightly swept-back spreaders and double lowers. An interesting wrinkle is for the aft stay to equilibrate the cutter stay load. 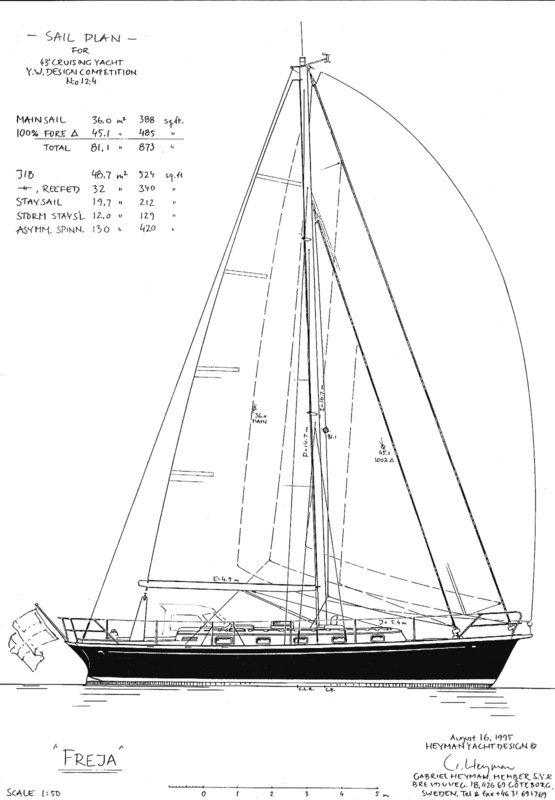 Being carried to the deck somewhat abaft the mast, it permits the boom to be squared well away before causing trouble, at which point, the designer suggests, it may be detached. “Freja is conceived as a heel-tolerant design. This to my mind is vital to any yacht that is to be cruised for long periods by a crew of two. Autopilots and windvane systems do not respond well to a hull form whose hydrodynamic values are changing drastically with each alteration of angle. The designer’s calculated displacement figure is optimistic at 9,440 kg. Granted he has specified a foam sandwich construction which has the potential to save weight, but on a cruising yacht of this complexity, the difference compared with a more conventional specification is not going to transform the overall loading by such a significant amount. “My immediate feeling was that here was a boat in which we could live comfortably. 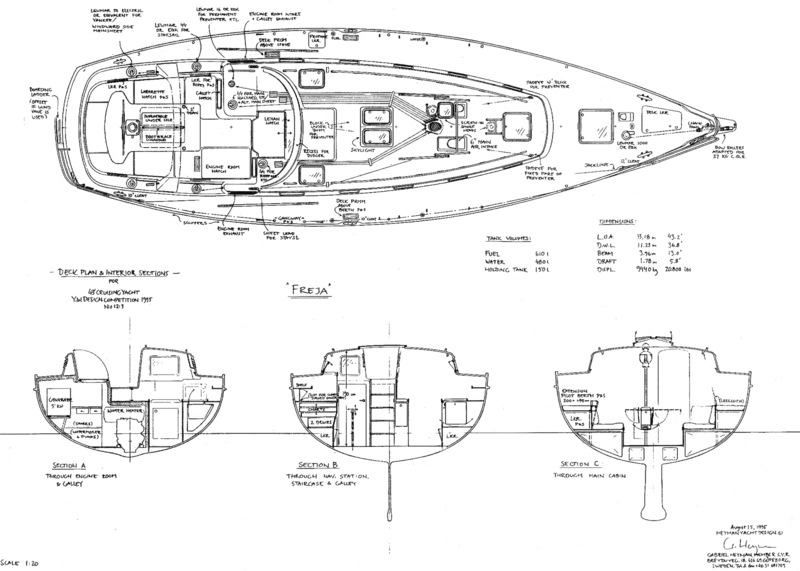 I felt that the designer must himself have been a liveaboard for long periods and have developed a real sense of values. I liked the proportions of the galley and its position close to the hatch for good ventilation at sea. I was not so happy about the standing-only chart table. I would not be happy to sleep with my head forward in the forecabin double bunk. So frequently in ocean cruising anchorages the motion is a factor and I can imagine occasions when I would opt for sleeping in the saloon.